Sat, Mar 23, 2019, 07:29 pm SL Time, ColomboPage News Desk, Sri Lanka. 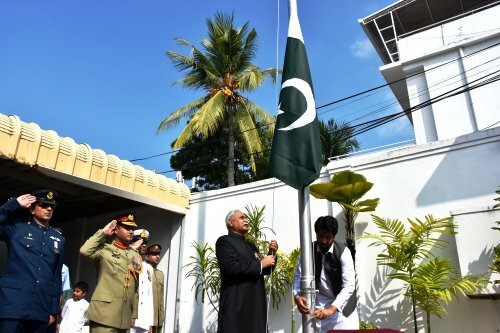 Mar 23, Colombo: The High Commission of the Islamic Republic of Pakistan and the Pakistani community based in Sri Lanka celebrated the 79th National Day of Pakistan on Saturday with traditional fervor and resolve to make Pakistan a strong, vibrant, progressive, democratic and welfare state. High Commissioner of Pakistan, Maj. Gen. (R) Dr. Shahid Ahmad Hashmat unfurled the Pakistani flag to the tune of Pakistan's national anthem in a ceremony held at the Pakistan High Commission this morning. 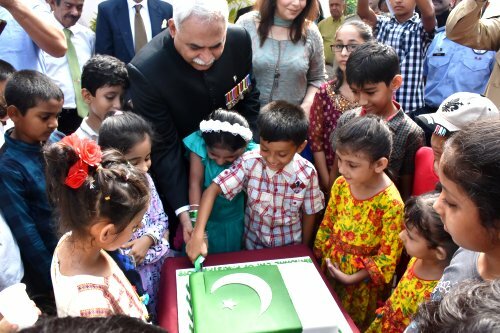 At the end of ceremony, a cake commemorating the Pakistan's National Day was cut by the High Commissioner along with children.